From camping to kite-flying, from picnic treats to summer stargazing, little ones will enjoy a perfect day of summer play with Curious George in this tabbed board book! 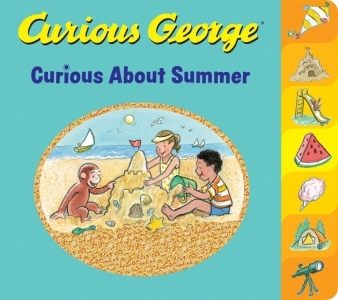 Join George and the man with the yellow hat as they enjoy a fun day at the beach, go on a picnic, enjoy a whirlwind of games at the carnival, and soak up that summer sun in this read-aloud book with rhyming text. Colorful tabs and sturdy pages are perfect for little hands. Preschoolers will delight in exploring a typical summer day in this sturdy board book with colourful tabs featuring everyone's favourite monkey, Curious George.